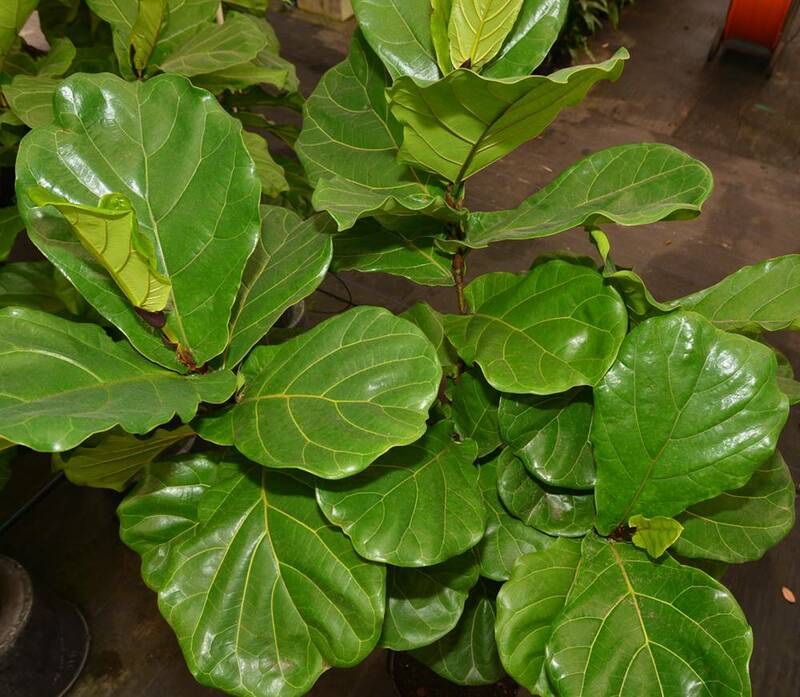 Check out this video to learn more about the Ficus Lyrata from our plant specialists. Read below for more information on caring for your Fiddle Leaf Fig. This plant is a moderate to heavy drinker, and can go for 2+ weeks without watering with the proper sub-irrigation system, but we suggest you check it weekly during the first 6-8 weeks after you get it and during hot summer months. See our watering guide for more information. 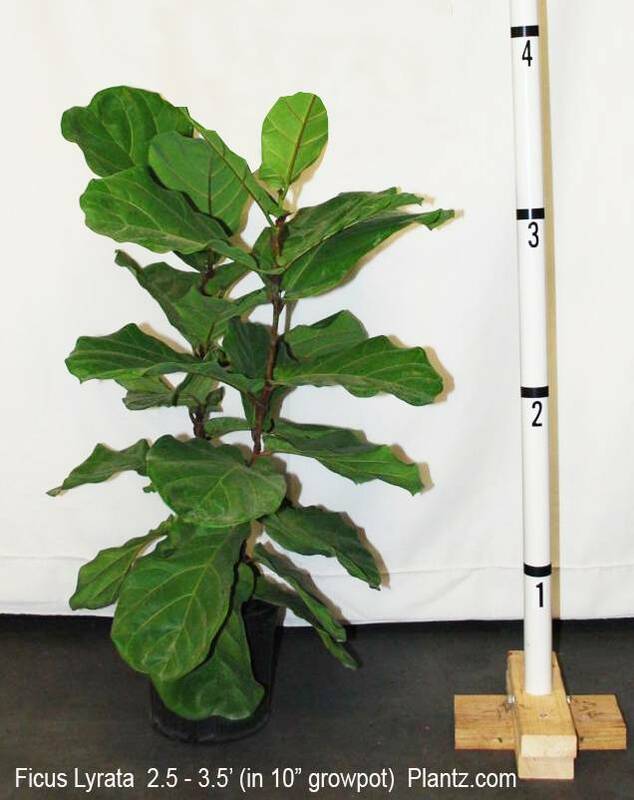 Next to watering, having adequate light is the most significant factor keeping your Lyrata happy inside. Your best placement is near a window where the plant can get some sun light – east-, south- and west-facing windows are best. It can also thrive in a room with strong ambient light. If you want a good, sustainable indoor plant and don’t have good light, this is not the plant for you – unless you’re up for moving it for frequent trips to better lit areas. 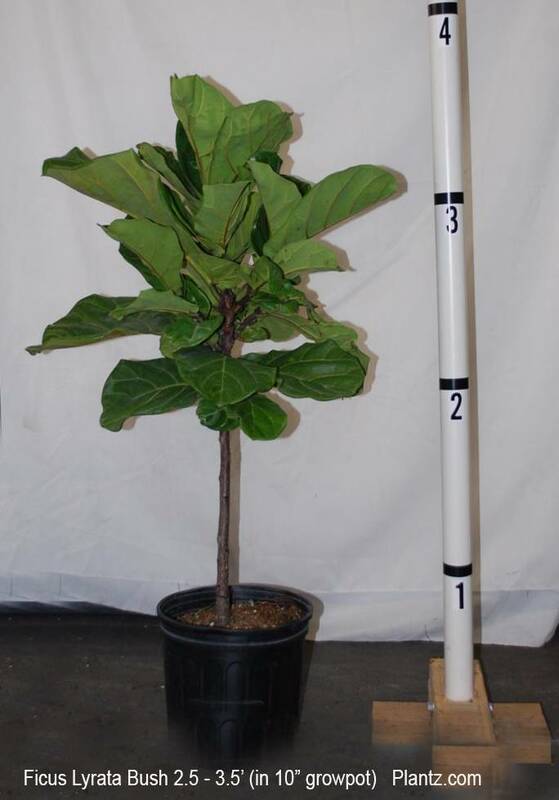 The Fiddle Leaf Fig likely will not need to be fed during the first 6 months after it has shipped. During this time, it will use the residual nutrients from nursery production. After 12 months, it can be fed quarterly with a complete fertilizer formulated for interior plants. If your Lyrata is positioned on a porch in the south, it may need supplemental nutrition sooner than 12 months. Keep an eye on the newer leaves – not the emerging ones; if the new leaves are yellow and the veins prevalent, it is possible it needs some nutrients. Please refer to our nutrient guide for details. Here’s one of the greatest benefits of this plant – its large leaves are easy to clean and, overall, there are fewer leaves than many other interior plants. Simply wiping the leaves with a wet cloth usually does the trick. For spots where something else (besides dust) has landed on your plant, use a mild soapy solution to wet the cloth; then wipe. 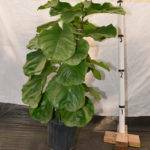 Many Fiddle Leaf Fig fans love to let this plant grow in all sorts of funky shapes. If that’s not your style, and you want to maintain the plant’s height and girth, pruning cuts can be made just above any node (aka – right about a where a leaf attaches to a stem). This will reduce the size of the plant and promote new growth from the point where the cut was made. You can also trim or snap off leaves that have run their course. Here’s another plus, this plant is not a big target for pests. Scale, mealy bugs, and mites sometimes jump on, but they’re easily controlled by wiping the infested area with a soapy solution. It can take several intermittent cleanings to rid the plant of the pests. Or…if you moved it from one light extreme to another, it could shed leaves. The most likely issues (#’s 1, 2, and 3) are easily correctable. Brown leaf margins – This is most likely from not enough light and under-watering. Brown spots and mushy leaf spots – This might be from too much water or exposure to cold temperatures. The best part about any of the above is that they’re easily corrected. The key, however, is recognizing the signs early and making the adjustment before too much damage occurs. 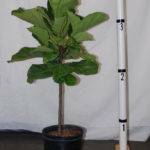 It has been reported that the sap from a Ficus plant is poisonous to dogs, cats, and horses. So, if you have a dog, cat, or horse, don’t let them ingest the sap. It’s also been reported that the sap can cause allergic reactions for people too. If you get sap on your skin, wash it off and wipe the area with rubbing alcohol; if it gets in your eyes, flush your eyes with clean water for 15 minutes. If none of this helps, call a doctor. I just received my Ficus Lyrata and it is nicer than I could have imagined. The quality of the plant and its size, I couldn’t believe I ordered this online. I have been to plant nurseries and haven’t seen plants of this quality. This fiddle-leaf fig is the perfect addition to an empty corner of my bedroom. Beautiful and healthy plant! Many thanks! Beautiful. vibrant and healthy. Definitely pleased with my purchase. My plants are beautiful and healthy! Plant unboxed well and is great! A few dead leaves but it’s transitioning well and is close to what I expected. Thanks! Due to our Connecticut location, we appreciate how conscientious Plantz was about temperatures in the Northeast and how it would affect our plant. They monitored weather temperatures and shipped during the appropriate temperature window. Plant arrived in great condition. It arrived as depicted, large, single stem with 2 off branches. It tends to tilt to one side , not completely straight, yet perhaps will change when rotated. Water Instructions are very helpful and spot on, so make sure you read instructions included in package label. So far our new plant is happy and acclimating nicely. Thank you Plantz, looking forward to purchasing another fabulous plant. I am in love with my Ficus! The most beautiful plant ever! Great customer service and I will definitely order again! The ordering was a piece of cake! My ficus is SPECTACULAR!!!!!!! I highly recommend PLANTZ!!!!! I will definitely be ordering again!!!! Many thanks to this wonderful company!!!! I love my plant. It is exactly as described in the picture minus the flower pot. Will buy again! This plant is lush, healthy and gorgeous beyond expectation! It arrived in perfect condition, along with many tips for keeping it happy! I LOVE my fig!! The tree is lush and green. A few leaves were torn and the leaf that sits at the very top was torn and detached from the leaf’s stem. All in all though, a beautiful plant. She arrived very healthy, much better than when we purchased previous plants and delivered them home ourselves! The packaging was extremely well done. I greatly appreciated the email to prepare for arrival, and afterwards, the phone call next day very thoughtful. Excellent product and customer care. I am in love with these plants. I order two and they are absolutely beautiful! Thank you so much! Beautiful Ficus. Well protected and easy to unwrap. I can’t believe they can ship a 5 foot tall live tree! Looks great! Impressed! The wife couldn’t be happier. The setup and everything, definitely dealing with professionals! I was very happy with the size and health of my new Fiddle Leaf Fig! Perfect! Thank you! The plant arrived in great condition, and it’s as beautiful as can be. I really appreciated the helpful information and videos that were provided to help make sure I knew how to care for the plant, as well as the follow-up phone call after it arrived. Great product and great customer service! Great size and quality tree. Packaging was excellent! The plant arrived with brown spots and can’t stand it self. I don’t know if will survive. They called me to see how the plant is. That was good. Vivian – Sorry the plant did not meet your expectations – it’s a perishable product and we lose control of its environment when we put it on the FedEx truck and there is damage sometime. We will be happy to send you a replacement. I love my new Fiddle Leaf Ficus! It’s beautiful and arrived very quickly. I appreciated the support and follow up after receiving my plant. Received a beautiful and healthy plant with clear and helpful tips on how to care for it. I am so happy with my purchase! The plant is beautiful, it arrived on time and in great shape. Awesome service. Great customer service. Quick response with any questions! Great plant! Great customer service! They really care about everything. The insteuctions that they sent were great. You can really trust them. Your packing and shipping care, plus the quality of your plants is excellent. Your company was recommended to me by a friend who had used it to order her large Fiddle Leaf Fig and raved about the service and quality she experienced from your company. Otherwise I probably wouldn’t have taken a chance on ordering a plant online. I would highly recommend your company to anyone who finds it difficult to find a source for quality houseplants in their area. Plus, getting a bigger houseplant transported to your home is not always easy! So ordering it online solves that whole problem. There’s no way I could transport a big houseplant in my vehicle and get it home undamaged! Gorgeous & so healthy. Best plant I have had, really enjoy it and many compliments. Plant arrived in perfect condition—no damaged leaves no broken branches. I love my plant! This thing brings me joy and Plantz makes caring for it idiot proof. Thank you! Love my ficus. Arrived in good order and it is really beautiful. Adds so much to my room. Love it! I am so happy with my plant, it is absolutely beautiful! Sue was amazing! This company isn’t about a sale, they are about making sure their customers get the right plant for their space and the plants get a home/space they can thrive in. After placing my on line order, I received an email from Sue checking in to make sure I was aware of the needs of the particular plant I had ordered and even offered to help me find an alternative if the plant would not do well in the space I had in mind. The plant was delivered a day earlier than I had expected, carefully packaged with detailed directions. I WILL buy from Plantz again and highly recommend them. Wow! 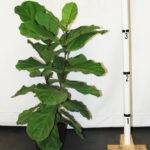 The FLF looks better than the picture on the site. I could not be more pleased. Hi – I sent you an email with some suggestions. It is probably just acclimating and it might lose a few leaves but if you’d like to send me a photo, I’d be happy to take a look. Beautiful plant. I would like to see instructions for care that are more realistic/accommodating to a normal care for a plant in a home. Currently instructions require visualization of capillaries, but I placed my plants in their original container in a basket. It’s very difficult to visualize the capillaries. I need to put it in something because the pot it comes in is not visually appealing and puts my floors at risk of getting wet and dirty. I am certain most people put theirs in something. Hi – Our sub-irrigation set up is primarily to make it easier to care for the plants and helps to avoid over/under watering. We do offer a soil sleuth which will pull up moisture from the root zone so you can feel the soil moisture and water the plant when it dries out. Many of our customers don’t completely understand the watering needs of a plant and tend to over-water thinking that a plant needs to stay wet to survive when plants actually need to dry down in between watering. If the sub-irrigation that we provide with each plant isn’t working for you, I’d like to suggest that you purchase a soil sleuth which will help. In addition, we offer planters on or website that are a perfect fit and we also have their dimensions listed so you can compare and shop for your own style if we don’t have one that fits your decor. I hope this helps! Fabulous tree, fabulous customer service. The tree was delivered in a timely manner and it was easy to unload and set up. I really love it. The plant was impressive from the first time it popped out of the netting, very happy with it. I was so impressed with this purchase. My plant came healthy and much bigger than I expected. Yes, there were a few tear and rips (very little) and brown spots here and there but that’s totally normal. Overall my plant was gorgeous and the packaging was phenomenal. I’m totally in love with it. Beautiful tree and very helpful instructoions were included. The plant arrived in great condition, well packaged. Instructions for setup have been very helpful. Thank you! Thank you so much for amazing customer service, Sue. You have been a dream to work with and I appreciate all of your help!! I would highly recommend Plantz! 2 trees arrived in perfect shape. With clear set up and watering directions. I’m so happy they look awesome! I LOVE my Fiddle Leaf Fig. It looked beautiful – even bigger and fuller than I’d anticipated – even the day it arrived in my Brooklyn apartment, all the way from Florida. It has acclimated to it’s new home so well and I have yet to lose a leaf – it’s gorgeous and I have received so many compliments from friends about it. They can’t believe it’s real it looks so good!